Blog Do My Wisdom Teeth Have To Come Out? Wisdom Teeth Removal Season Is Upon Us. Did you know wisdom teeth have a season? While we are joking about this the most common time for their extraction is early summer and Christmas time off from school. This is because most of the people getting them removed are 17-21 years old and the most convenient time is when they are off from school. Wisdom teeth removal is a significant rite of passage for many in their late teens and early twenties. They post images of their swollen cheeks on social media, share videos of themselves acting loopy from the anesthetics on YouTube, and enjoy an excuse to drink as many smoothies as possible. But why do we have these teeth in the first place if most of us just get them removed? Why Do We Have These “Wisdom Teeth” Anyway? No one really knows the answer to this. Not wanting to start some sort of evolutionary debate there are many theories. The Most common theory of why we have these 3rd molars is that we are evolving out of them. The theory goes that we needed more teeth in prehistoric times and now we don’t need them, so they are evolving out. Our ancestors had a very fibrous and coarse diet. Unlike a modern menu of softer cooked and processed foods, theirs consisted of roots, fibrous plants, and raw meat, so they actually needed their wisdom teeth. Some believe, and they have evidence to point to this that some peoples such as native aboriginal Australians have room for their 3rd molars. But this could also be that some families have larger heads than others thus giving them space for the 3rd molars. In our office, we have a couple of families where the parents and kids have their wisdom teeth. This is not very common, but we have some families that have accomplished this rare feat. So who really knows why we have wisdom teeth? Some people don’t have wisdom teeth, the lucky ones. Most people do have 4 wisdom teeth. A 3rd molar or wisdom tooth is the most common tooth to be missing or to have extra of. We have seen at McOmie Family Dentistry a person with nine 3rd molars!! It is not too unusual to see a person with no 3rd molars. 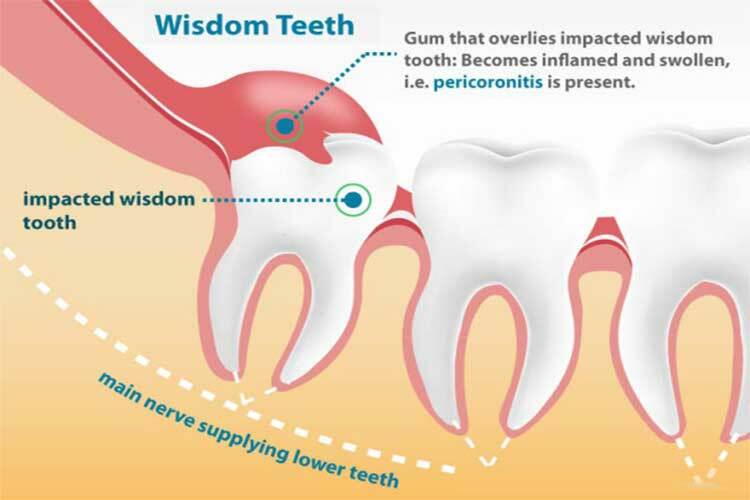 Most of the time the reason for taking the wisdom teeth out is because they are semi-impacted. Impacted is where the tooth is stuck in the bone or the gums, or both. The worst scenario is the semi-impacted tooth, and this is where the tooth has partially erupted, you can see some of the tooth sticking out of the gums. If this tooth is not removed proactively, then the gums will get something stuck in them, and this will cause an abscess. These abscesses are an infection that can be life-threatening and very painful, they can also damage other teeth that are otherwise healthy. Fully impacted teeth can cause problems as well. They can resorb the roots of the teeth they are stuck against. Impacted wisdom teeth can also lead to dental tumors such as dentigerous cysts. These problems can lead to numbness that can be permanent. There are times where we recommend leaving impacted 3rd molars. Sometimes they may be on top of the mand nerve, and Dr. McOmie may feel the risks is not worth the reward for taking the tooth out. We never want to have lasting problems because of an extraction so if the tooth is too far entangled in the nerve or if it is in the sinus Dr. McOmie may recommend not taking the tooth out. Each and every person is evaluated case by case. There is no blanket rule on wisdom teeth removal. Each person is treated in regard to that person and no one else. Dr. McOmie does most extractions here at McOmie Family Dentistry. We take out lots of wisdom teeth. We love to be a one-stop shop for our patients, and this is one of our services. There are times that we send our patients to Oral Maxillofacial surgeons to have wisdom teeth removed. In cases where the person wants to be put to sleep to have them removed or if we feel it is more likely complications to arise. Make sure and keep your mouth as clean as possible we often put our patients on a prescription mouth rinse before we do an extraction of the wisdom teeth or any other teeth. Make sure you rest up and eat well before your day comes. Allow yourself time to heal and don’t over schedule your time the day of or the next day. It seems the younger you are, the less recovery time it will take. Most 18-year-olds we take wisdom teeth out on only miss an afternoon of activities, a 40-year-old may miss a day or two of work. After your extraction do not mess with the extraction sites just leave them alone and follow your post-op instructions closely. Dry sockets are the most common problem with wisdom teeth removal they happen about 5% of the time which isn’t a lot, but when they happen, it isn’t fun. We do special things at the time of extraction to prevent this and give you instructions on how to prevent dry sockets. No two cases of wisdom teeth removal are exactly the same, which is why at McOmie Family Dentistry we approach them on a case-by-case basis. We watch our adolescent patients progress as they come in to determine whether extraction will be necessary. Some discomfort is normal for any teeth coming in, but if you’re experiencing what seems like an unusual amount of pain from your wisdom teeth, come see us right away. We monitor our patients 3rd molars at every visit, and we will let you know when and if they will need to come out. We love our patients, and we thank you for reading this post. This has been meant as a brief overview of wisdom teeth removal. If you have any questions or concerns our wisdom teeth, please give us a call. McOmie Family Dentistry 423-899-1112.